Shrinking frogs, indicate evolutionists becoming enlightened by devolution. 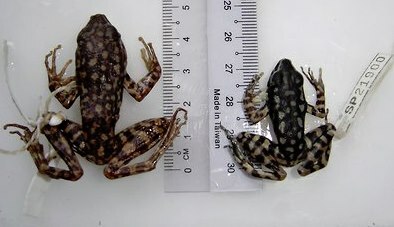 Male frog specimen collected on Mount Kinabalu in Malaysia in the 1980s, left, versus another collected in 2008.
. . . . . Change’s laundry list of impacts — . . . just got a new addition: shrinking species. No, not population sizes, but a diminution in the size of the animals by comparison with the pre-. . . days. “I don’t think that organisms will shrink to the degree that you’ll walk outside and see that trees are suddenly half the size that they used to be,” said Jennifer Sheridan, a conservation biologist at the University of Alabama and a co-author of a paper describing the phenomenon in Monday’s issue of the journal Nature Climate Change.
. . . the shrinking among species in general is noticeable, Dr. Sheridan said — at least to scientists studying them. And in the long run, she suggests, changes in species sizes could have major implications for crop production and the availability of protein sources like fish. Judging from the fossil record, creatures like beetles, spiders and pocket gophers shrank ……. Yet the research community over all has been less than enthusiastic about embracing the idea. “The scientific community is really hesitant to publish things that are potentially inflammatory,” said David Bickford, an evolutionary ecologist at the National University of Singapore and a co-author of the paper. “People don’t want to think that this is a new reality, everything shrinking.” woops! not a conspiracy just emotional bias against evidence! 20 to 30 studies have suggested that the shrinking phenomenon is occurring across species. The two researchers compiled evidence of shrinking species across the globe from the scientific literature, presenting an aggregate view of what has been discovered and deduced so far. Although some plants were initially expected to flourish on the extra carbon dioxide in the atmosphere associated with global warming, their growth is also dependent on temperature, humidity and nutrients. So in areas that are getting warmer and dryer, many plants have become smaller and less able to thrive, the researchers write. Plant growth is also directly controlled by water, which is becoming more limited as regions like the subtropics become drier. Even areas where increased rainfall is predicted, like the equatorial and high-latitude regions, will see increased variability in rainfall, which probably means they will also experience some periods of very limited rain, the authors write. Droughts in many regions are expected to result in more forest fires, which reduces the nitrogen in soil that is a critical factor in plants’ growth, the study says. from deer to rabbits to insects — will need to eat larger quantities of smaller plants, the scientists say. And animals that prey upon herbivores will need to eat more of their shrinking prey to maintain their body sizes, the thinking goes. If predators like wolves, hawks and robins cannot meet their energy demands by catching numerous smaller prey, they may simply adapt by shifting to eating other species, the study says — or they could begin to shrink themselves or even die off. Drought also generally leads to smaller offspring, who would in turn have smaller offspring. In one set of experiments, the paper’s authors exposed corals, scallops, and oysters to the increasingly acidic sea conditions that are expected to ensue with climate change, and the animals’ growth rates declined. In laboratory experiments, for every 2 degrees the scientists cranked up the temperature, various types of fruit size decreased anywhere from 3 to 17 percent. For fish, the shrinking was even more pronounced, from 6 to 22 percent. If all animals were to engage in coordinated shrinking it might not be so bad, the researchers speculate. For now, such outcomes are simply possibilities, although the authors believe that shrinking is here to stay. Dr. Bickford said the paper was intended as an non-alarmist appeal to the world’s ecologists to take notice. “No matter what else they’re doing in the field, we want more ecologists to pay attention to body size and take these measurements,” he explained. Martin Daufresne, an aquatic ecologist at Cemagref, a government environmental research institute in Aix-en-Provence, France, described the new paper as “very interesting.” It “brings new insights to the topic by discussing the generality of these patterns and their potential causes, and by suggesting future research directions,” he said. On the golf course each have obstacles of ponds, trees, and sand traps. The organism (the golfer) earns to adapt to his environment. However, his adaptations and adjustments, muscle building, technique, all of things do not pass on genetically to his children, the slate is cleaned in a sense,. . . obstacles never affect the offspring.